Pop Told Me: Guess What?...... I love you! Putting cursor on screen, to type, is often the very last thing I do when composing a post. Today it was the very first thing I wanted to do. I didn't need inspiration, recipes, or pretty photos to say what I wanted to say because this post is all about saying thank you to someone who has made it their mission to give extra my entire life. The awesome part is that I'm pretty sure they had no idea just how much all the little 'extra' things they've done throughout my life really meant. In fact, the ironic part, is that I feel quite guilty to only have recently realized this was the case. That someone who had made so many moments in my life so meaningful might not even know just how much that was true. Momma Told Me is a blog all about my mother; at least in namesake and concept, there's a little bit of her in nearly every post. That's because my mother was disabled and home with me every day growing up; before and after school and on vacations. What you may not know, a running joke in my family (and still something Momma jests about to this day) is that I was, in her words, a 'contractual obligation' to my parents marriage. You all know Momma is awesome, and she loves me immensely, and the term may still sound like bit of a shock. Take a breath, it's a simple way of stating, prior to marriage, my mother never envisioned herself having kids. My father is quite literally the reason I was born, you can say I truly do owe him my life. This is important to note because it gives you, and me, some insight into the sort of father he was destined to be. He wanted children and I WAS his child. As a parent he took his job very seriously, but as a father he made the most of every moment. Now my Pop, as we have referred to him here in the past, is a fairly private person; and I generally leave his photos and information involving him off the blog as a method of respect for this. But it's hard to keep all those great childhood stories and memories to myself, so every now and then, they slip. Just a month back we were visiting some family and somehow it came up that my father had read about himself on my blog. In one of my posts I had referenced a little game my father and I played for years with each other's lunches. 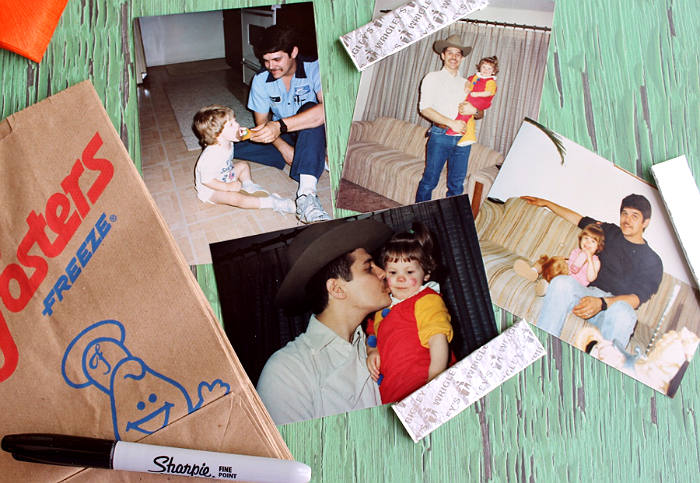 One day, when I was in grade school, my father decided to pick up a permanent marker and draw a few smiles and encouraging notes on my sandwich baggie and snack wrappers. He worked Monday through Friday and was often gone for work before I was even up for school, so this was a way for him to connect with me even though he was away. A one time thing turned into a battle of doodles and notes that lasted years through even high school. Before long I was sneaking out of bed to write (in permanent marker, mind you) on his lunch bags and containers. Momma was always furious, but I insisted on it anyway. After all, the number of days I ran to school to unpack my lunch, or reflected back on those notes during a tough day, were more often than not. This was a single example of just one thing my dad had done to give extra during my childhood, and I was quite upset to hear how shocked he was to read, on my site, how much it had meant to me. How had something I had told countless people about over the years not found it's importance to my own father's ears? So, with November upon us, a time for reflection and thanks, I committed myself to chronicle some of the father/daughter memories that meant so much to me, and ensure that the person who had made them all possible knew just how appreciative I was. 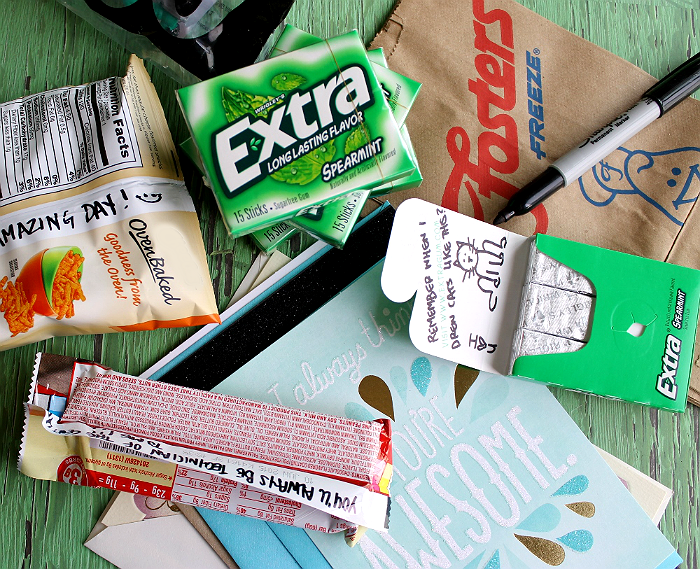 In fact, Extra Gum is challenging everyone to do the same and Give Extra with a little note or gift that helps recognize all of the wonderful Extra in our lives. Something as simple as a pack of gum with a sticky note can really change a person's day and say thanks. Since my father and I had such a bond over lunches (food in general, really) I thought it would be appropriate to make him sack lunches for work one week. 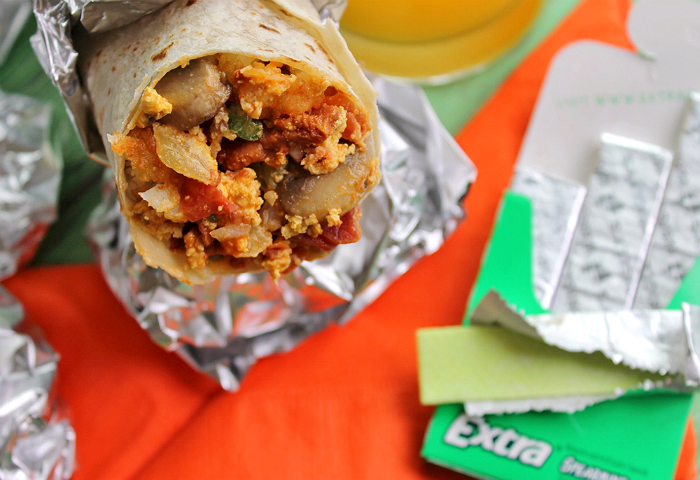 Because he travels during the day, and his 'lunches' have to be on the go, I went with meal bars and a bag of chips; and handmade him some breakfast burritos to kick start his work day. My dad is always sending me texts saying "Guess What?....I love you!" and this was a chance to say it back in my own way. *When I was a little girl my father, 'the ice cream man' as I referred to him, would bring home all sorts of surprises for me from the restaurants he serviced. I was spoiled with entire collections of Happy Meal toys, and various chain collectibles, so I was sure to include a happy meal toy in one of his lunches! *One of my favorite mementos he'd bring home were napkins from a popular ice cream chain. We'd sit and enjoy our hand scooped ice cream sundaes at home, and pretend we were eating 'the good stuff' with the fancy napkins that had the smiling ice cream face. So I made sure to stop by that chain and get some paper bags with the logo to put his lunches in. 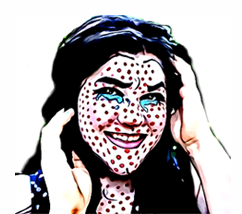 *As a little girl, my father taught me to play checkers, delicious checkers- our Hershey's Kisses checkers board gave Momma a panic attack on more than one occasion as I attempted to shove all the 'Kings and Queens' into my mouth in victory. One of his lunches had a few Kisses for good measure. *Cards have always been a 'thing' between my father and I. I have nearly every card my father ever gave me, back to about 6 years old. I even have the ones made on one of our first home computers. On the back of each homemade card he'd print 'Dadmark,' something I quickly copied on ever handmade card I've ever made since. Even my Valentine's heart cutouts, from there since, have said 'Jenmark.' 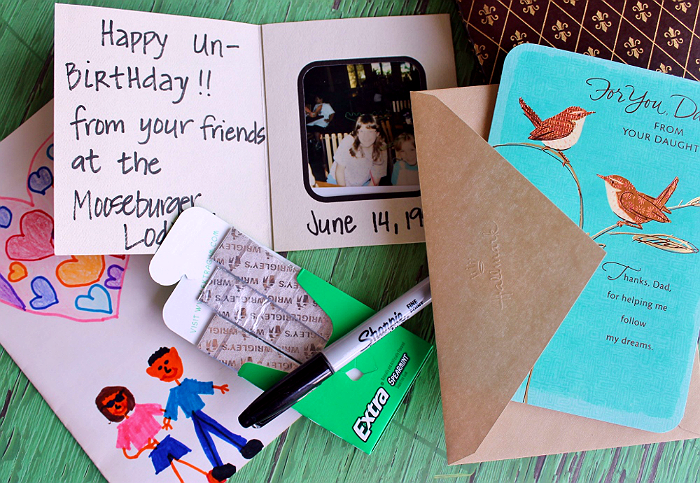 Each lunch bag I made had a special card inside with a (wordy) note about memories and thanks for my father. 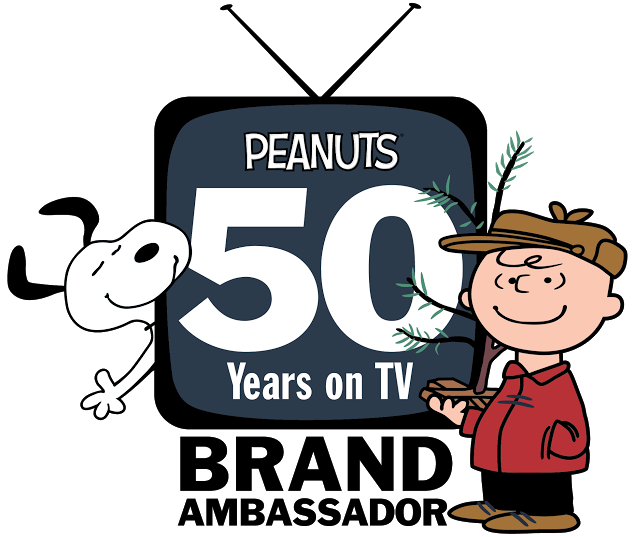 *One thing I remember distinctly about my dad, growing up, was how frequently he chewed gum. He chewed it during the work day, while traveling, and while doing invoices and inventory at home. So, on top of writing notes inside of wrapper seams, I also continued our doodle tradition with a pack of Extra gum, in each bag, and individual notes on the package for my father. I am certain every time he flips up the top of those packs of Extra gum, wherever he is, he will smile! We all have people in our lives who have given extra in a time of need; but sometimes we forget to stop and thank the people who have always given extra, whether we needed it or not. My dad never did all the little things for thanks he did them because he hoped they would mean, if even a little, to me. Little did he know just how much they really did mean! How many lunches did your parents see you off with, growing up? 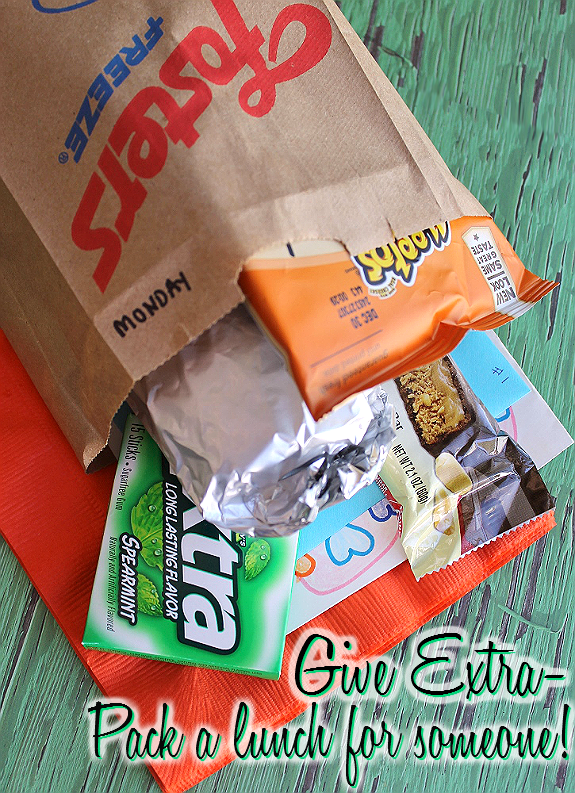 Wouldn't it be a nice reminder of thanks to unexpectedly bring them lunch? What other ideas do you have to help give back a little extra to someone who impacts your life everyday? 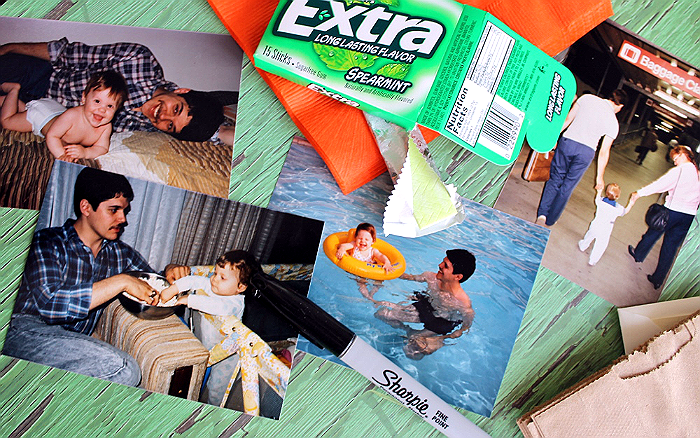 Follow the #ExtraGumMoments hashtag on social media, Extra Gum on Facebook, @ExtraGum on Twitter, and Extra Gum on Pinterest to see more stories like mine, and more creative ways to give extra this season! What Daughter Says: Being a parent goes beyond having children. I'm thankful for all of the 'extra' things my father has always been there for and done. 1. To prepare cheese sauce combine 1/2 C milk and flour in saucepan and whisk. Stir in remaining milk, salt, and chipotle powder and bring to a boil over medium heat. Reduce heat to low and continue to stir about 2 minutes, or until texture is even. Remove from head and cheese in sections/cubes. Stir until cheese is fully melted. 2. Prepare vegetables in a skillet over medium heat with approximately 2 TBS butter. If preparing mushrooms these will need to be added before any peppers, onions, or tomatoes. Cook veggies until they reach desired level. Drain any excess moisture and add Egg Beaters. Scramble over medium heat until fully cooked. Certain vegetables may continue to lose moisture while cooking in egg mixture, drain before serving. 3. Arrange ingredients in light layers an inch and half in from right edge of tortilla, and an inch and a half in from top and bottom. I typically begin with a smear of cheese sauce, eggs, veggies and torn taters, meats, then cheese. Once you have filled your tortilla gently fold the top and bottom up over the toppings, followed by the right lip of tortilla. Holding the burrito at both ends, roll from right to left. Smear some extra cheese sauce 1/2 inch in from the left tortilla edge to help seal the burrito. Wrap in foil and store in fridge for up to 1 week, or frozen up to 2 months. This is a beautiful post and reminds us that it isnt gifts of 'things' but rather time that kids treasure the most. He sounds like a wonderful man and truly embodies the word FATHER . 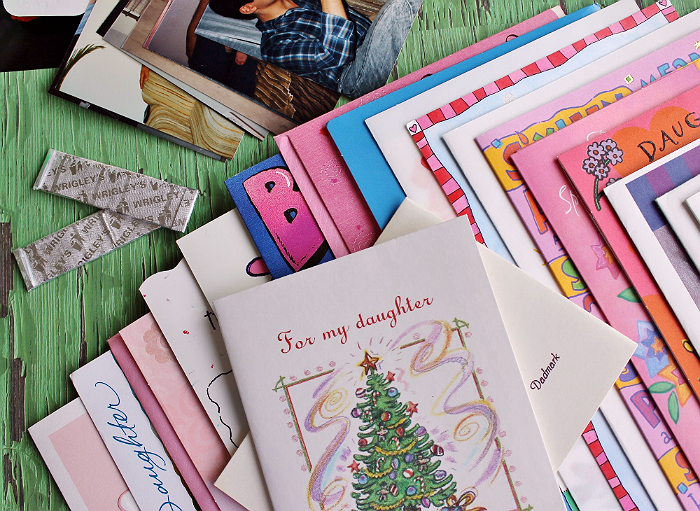 It made my heart smile seeing the cards and notes you have saved and how highly you speak of him. To love aand be loved is the most important in life and you and he are both blessed to have such a wonderful relationship. 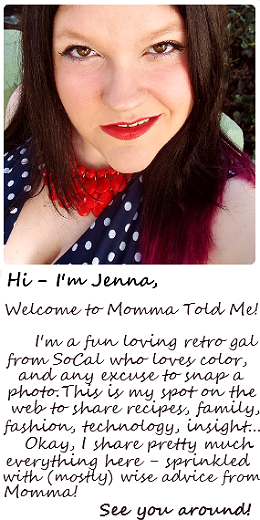 I love this post, Jenna! Such a wonderful tribute to your relationship with your father. Each picture was so interesting, too. Thanks for sharing these stories with us. This is such a great post. I can feel the love radiating off of my computer screen right now. I love that you had entire collections of happy meal toys. I ALWAYS wanted to get the full collection, but I never could. I love posts like this. 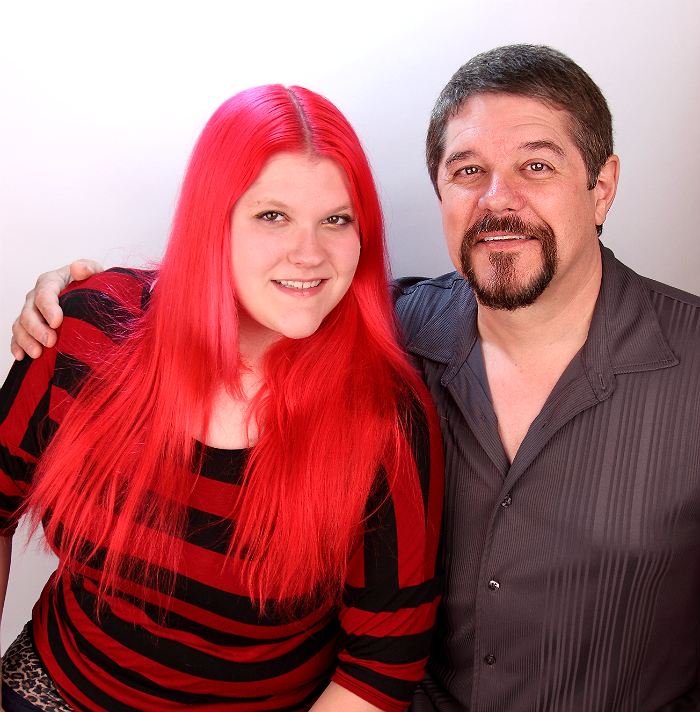 It's so great to hear about the wonderful relationship of a father and his daughter. Wonderful. What a wonderful tribute! I wish my father was still alive so I could do something similar..
Great post and pictures! Sounds like you have a wonderful relationship with your father. It makes me miss my dad so much. Hugs. Awe so sweet. My Dad was the best, makes me think of all the great time we had together! This is such a great post! What a great idea, it is so important we let those around us know we love them!! What a cool recipe! I love the tater tots addition, which my kids would love. I ALWAYS tell my kids how much I love them because that is something I did NOT hear when I was growing up. 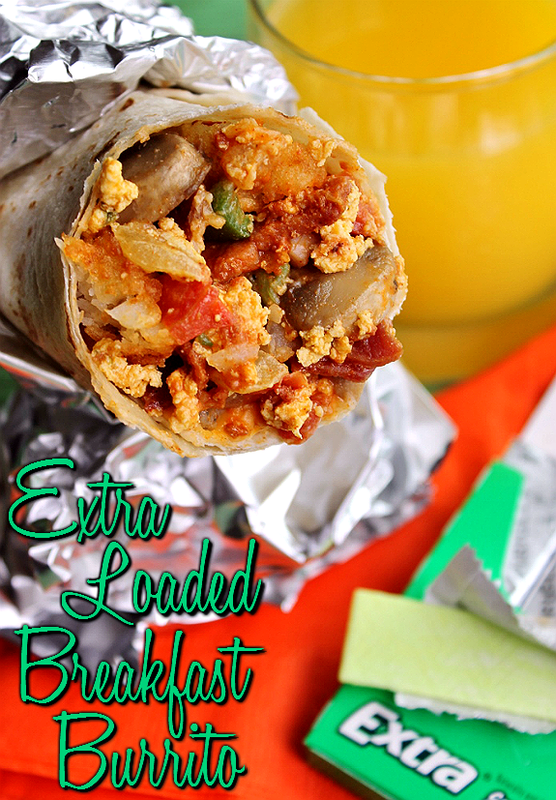 I can't have a breakfast burrito without potatoes- and the tater tots really have a great texture with minimal effort! Your dad is one heck of a guy. I loved, loved, loved reading all about the special little memories you hold so dear. I think the chance to pack his lunches for a week is such a neat idea! I like this brand. it offers long lasting flavor! What great memories you have of your dad. I chew Extra all the time. love the long lasting flavor. Oh my gosh! That was an amazing story! I love that you have such a sweet relationship with your dad! Keep those stories coming! Also, I love the idea of giving back 'extra'. It would be awesome to be able to go through your day giving back not only to those you love, but to anyone who affects you in a positive way. Make sure you tip extra, and tell everyone to have an amazing day! What a LOVELY beautiful post! LOVE the photo of you and your father toward the bottom, and what a good looking daddy you have! I understand about him being private but sometimes you just gotta put it out there how much you love someone. I too did special things for my kids lunches when they were little. Even today I still will make faces on their sandwiches or arrange foods in a fun way. My husband and I have this little statue called a "sweetie" it is one of those little girls with arms spread that has the saying on it "I Love you this much" we have a tradition of hiding it not from but FOR each other in strange places for the other to find. I think things like this are important in life. Being a parent goes beyond having children. ----> This quote needs to be printed in a book!! Loved your sentiments about your dad. It sounds like he is really a wonderful dad and raised a terrific daughter. 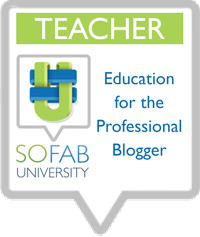 I'm a teacher so I have lots of opportunities to give back to others. I try to impact at least one student every period by having a personal conversation, encouraging them to try something new, or maybe noticing something they did well. Your father sounds truly wonderful, and I am sure your incredibly thoughtful lunches have made his week extra special. I have amazing parents as well, and I know that I don't show them how much they are appreciated often enough. When I was young, we used to have homemade cinnamon rolls on Saturday. So this weekend, I want to make a special batch just for them. That would be great Rebekah! I have always found so much enjoyment in doing random gestures for people, and my father is a big inspiration in that! I'm tickled to hear I have inspired you to give extra too! One of my friends is doing 30 days of giving back this month so I am going to take some of his ideas on giving extra. So far he has invited a homeless person to have lunch with him and then yesterday be purchased some notebooks and wrapped them and left them on vehicles at a local college. I am not as creative about things like that but he had some really great ideas. I think it is always important to give back to others and to give a little "Extra". That's so neat- are they a blogger? I would love to check out his progress and some of his ideas! I am always looking for simple ways to give back too! Such a lovely post. What a nice reminder to share how much we love our family and friends. We always have Extra in our car for those fresh breath moments. We would need it after that amazing burrito. LOL! I will occasionally buy my friends coffee, treat them to dinner, etc. Or I bring healthy snacks to share. Just little random things that makes us all happy. That is such a sweet tribute. I haven't heard from my dad in two years but he still means a lot to me. This is an absolutely wonderful tribute. Both of you are simply amazing! For me, I would want to give back to my dental school professor who had faith in me even through my hardest times. I would also want to give back to the homeless in my community! What a beautiful heartfelt message! Your dad sounds amazing! My parents are both the rocks in my life next to my husband. They all encourage me and always believe in me no matter what and therefore are Extra special.